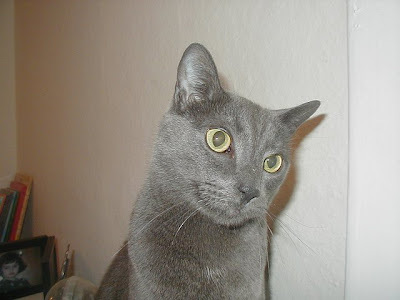 Meet my cat, Norbert. Sure he looks innocent enough. A little blank behind the eyes, perhaps, but he doesn't look like a killer does he? Well he is. He's a book killer. I reviewed Jane Yolen and Heidi E.Y. 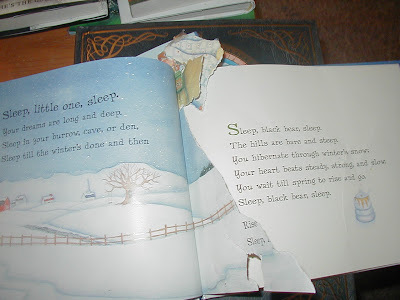 Stemple's perfectly lovely Sleep, Black Bear, Sleep (illustrated by Brooke Dyer) for Book Buds yesterday (link should be up soon) and what did this cat do? Take a look. He shredded two pages out of this beautiful book. He's always shredding things, so when I heard him ripping through yet another paper product yesterday, I wasn't surprised. Oh well, I thought, there goes the kindergarten newsletter. But this! This is a new low in the life of Norbert. Anyone in the market for a cat?